Epithelioid hemangioma (EH) is a relatively common benign vascular tumor that usually occurs within the skin or subcutaneous tissues . Less frequently, it can also occur in bone [2–9]. Epithelioid hemangioma of bone is typically found in adult patients, presenting most commonly as a solitary lesion, as in our patient, but approximately 25% may be multifocal. The differential diagnosis of EH includes epithelioid hemangioendothelioma (EHE), epithelioid angiosarcoma (EA), and metastatic carcinoma. Although most commonly found in soft tissues, epitheloid hemangioedothelioma (EHE) can potentially arise in any organ and pursues a clinical course intermediate between that of benign vascular tumors (hemangiomas) and frankly malignant tumors (angiosarcomas) . EHE of the bone is extremely rare and occurs predominantly in males. It most frequently occurs during the second and third decades of life but has been described in patients ranging in age from 10 to 73 years. The lower extremities are most commonly involved . It can often be difficult to differentiate EH from these more malignant conditions, but since the prognosis for each of these diseases is different, accurate diagnosis is necessary to determine an appropriate therapeutic course. We describe a diagnostically challenging case of epithelioid hemangioendothelioma of proximal phalanx of 2nd toe of left foot. 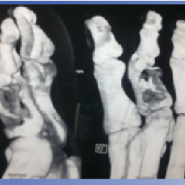 A 52-year-old man presented with six months history of intermittent toe pain with swelling (Fig 1). There were no constitutional symptoms. On further evaluation, radiography showed a lytic expansile lesion with a distinctive “soap-bubble” matrix with a sclerotic margin. No periosteal reaction was present (Fig 2). CT, MRI & 3D reconstruction scan report shows non-specific lesion in the proximal phalanx of second toe of left foot (Fig 3, 4 and 5). The differential diagnosis of the lesion after all the above mentioned investigations were aneurysmal bone cyst and unicameral bone cyst. Taking into consideration the severe degree of pain that the patient experienced at the time of presentation, the decision of disarticulation of the second toe at the metatarsophalangeal (MTP) joint was taken. After obtaining a written and informed consent from the patient and his attenders, disarticulation of the left second toe at the level of MTP joint was done. Gross appearance of tumor show multiple cavities filled with clots (Fig 6). The biopsied specimen was sent for histopathological examination, which showed a cellular solid vascular lesion in the bone. Lobular pattern of growth with trabeculae lining the vascular spaces were seen. The cells were large epitheloid with abundant cytoplasm and occasional vacuolation. Thus, the diagnosis of EHE was confirmed. The patient was subjected to a whole body bone scan after disarticulation which showed no secondary spread (figure 7). The patient was followed up at regular intervals and has shown no complications till the completion of two years. Vascular tumors of the bone have been classified in the past into three main categories, namely, benign hemangiomas, intermediate grade malignant hemangioendotheliomas, and malignant angiosarcomas . Epithelioid hemangioma (EH) is a benign vascular tumor of the soft tissues, and it infrequently occurs in bone. EH of bone most commonly presents as a solitary lesion, but may be multifocal in one-fourth of the cases . It is typically found in adult patients, rarely in children. EH most frequently affects the femur followed by the tibia, the hand and foot bones, and finally the bones of the axial skeleton [11, 12]. EHE is as an intermediate-grade malignant vascular neoplasm. It can occur at any age, but is more commonly seen in the second and third decades of life, and has slightly more prevalance in males [11,12]. The most frequently affected bones are the tibia, femur, and humerus, and disease is multifocal in almost half of the cases with an aggressive clinical course. Pain is the most common presenting symptom in patients with these tumors, although it may be discovered as an incidental finding . Radiographically, EH is predominantly lytic with well-defined sclerotic margins and thick reactive bone formation. EHE can be seen as multiple lucent lesions, commonly with areas of peripheral sclerosis on a radiograph. It is difficult to distinguish between them by radiological means and histology is the only investigation that can establish the diagnosis. Histologically, EH is characterized by its distinctive architecture and cytology [6,7,11,15]. The characteristic features include eosinophilic cytoplasm with round or oval small nucleoli and lobulated arrangement of the vessels. However, most of the epithelioid hemangiomas of bone do not display the characteristic inflammatory background typically observed in soft tissue epithelioid hemangiomas . Histologically, EHE can be distinguished from EH by the appearance of its vessels. The vessels in EHE are more commonly arranged in cords or nests without lumina [6,11]. The lumina are less conspicuous in EHE than they are in EH. Moreover, the stroma in EHE has a hyalinized or myxoid appearance, which is absent in EH. Diagnosis is important as aggressiveness of both tumors and prognosis differ. Wide surgical excision is recommended for EHE but in some cases, local curettage, percutaneous radiofrequency ablation and embolisation of the feeder vessel followed by curettage and bone cementing has been used. Radiation can also be used either alone or in combination with surgery, particularly in nonresectable lesions or metastatic disease. The prognosis of EH is unknown, but surgical excision is usually curative. However, recurrence has been reported in two cases in the past[6,13,14]. Thus even if the diagnosis is after excision of the lesion as in our case, it does has definite bearing on prognosis of the patient and regular follow ups are needed to prevent recurrence. We present a patient with EHE with histological features reminiscent of osteoblastomatosis. To our knowledge, this is the first case of EHE with such features. It can often be difficult to differentiate EHE from these more malignant conditions, but since the prognosis for each of these diseases is different, accurate diagnosis is necessary to determine an appropriate therapeutic course. Careful attention to the histopathological features is necessary for the confirmation of the diagnosis. 1.Haap.M, Kotter.I, Horger.M et al. Disseminated epitheloid hemangioendothelioma mimicking symptoms of systemic vasculitis. Onkologie. 2005; 28:429–432. 2.Cone.R.O, Hudkins.P, Nguyen.V, Merriwether.W.A. Histiocytoid hemangioma of bone: a benign lesion which may mimic angiosarcoma. report of a case and review of literature. Skeletal Radiology. 1983; 10(3):165–169. 3.A.A.De Smet, D.Inscore, J.R.Neff. Case report:histiocytoid hemangioma of the distal end of the right humerus. Skeletal Radiology. 1989; 18(1):60–65. 4.J.F.Fetsch, S.W.Weiss. Observations concerning the pathogenesis of epithelioid hemangioma (angiolymphoid hyperplasia). Modern Pathology. 1991; 4(4):449–455. 5.V.L.Fornasier, S.Finkelstein, G.W.Gardiner, D.Wong. Angliolymphoid hyperplasia with eosinophilia: a bone lesion pathologically resembling Kimura’s disease of skin. A report of two cases. Clinical orthopaedics and related research. 1982; 166:243– 248. 6.J.X.O’Connell, S.V.Kattapuram, H.J.Mankin, A.K.Bhan, A.E.Rosenberg. Epithelioid hemangioma of bone: a tumor often mistaken for low-grade angiosarcoma or malignant hemangioendothelioma. American Journal of Surgical Pathology. 1993; 17(6):610–617. 7.J.X.O’Connell, G.P.Nielsen, A.E. Rosenberg. Epithelioid vascular tumors of bone: a review and proposal of a classification scheme. Advances in anatomic pathology. 2001; 8(2):74–82. 8.D.Ose, R Vollmer, J.Shelburne. Histiocytoid hemangioma of the skin and scapula. a case report with electron microscopy and immunohistochemistry. Cancer. 1983; 51(9):1656-1662. 9.J.Rosai, J.Gold, and R.Landy. The histiocytoid hemangiomas. A unifying concept embracing several previously described entities of skin, soft tissue, large vessels, bone, and heart. Human Pathology. 1979; 10(6):707–730. 11.Nicolau Pastrie F, Moggi Zafferani V, Ramis Bisellach P. Costal epithelioid hemangioendothelioma. A case report. Arch Bronconeumol. 1998;34:467. 12.A.T.Deyrup, A.G.Montag. Epithelioid and epithelial neoplasms of bone. Archives of Pathology and Laboratory Medicine. 2007; 131(2):205–216. 13.M.S.Sung, Y.S.Kim, D.Resnick. Epithelioid hemangioma of bone. Skeletal Radiology. 2000; 29(9):530–534. 14.V.Madhuri, N.M.Walter, R.J.Korula, S.Nair. Epithelioid haemangioma(benign haemangioendothelioma of bone)-a case report. Indian journal of cancer. 1996;33(4):173–177. 15.G.P.Nielsen, A.Srivastava, S.Kattapuram et al. Epithelioid hemangioma of bone revisited: a study of 50 cases. American journal of surgical pathology. 2009; 33(2):270-277.